Janie Thompson was the founder of Brigham Young University’s Young Ambassadors and Living Legends, which continue to tour internationally. She wrote and produced shows long after her retirement in 1984 and she published more than 100 musical works. Thompson was born in 1921 into a musical family in Malta, Idaho. She taught herself how to play the piano. She later took lessons for a few years, then continued studying music at BYU. She also played piano for dance classes at BYU and other schools. She earned her bachelor’s degree in music in 1943. She joined a band as a singer, and later joined America’s Band, which performed for the troops overseas during World War II. In 1952, Thompson became the founder of the BYU Student Program Bureau. The same day BYU president Ernest L. Wilkinson asked her to start it, she had received an offer to join the Ike Carpenter band. Her decision to set aside a career as a professional entertainer and follow what she considered a calling from God set her on a path to influence many young people and change the course of their lives. During the first four years, she traveled to every high school in the state of Utah and put on more than 2,000 shows. She also put together several youth productions for the Young Women’s Mutual Improvement Association. Experiencing burn out, she moved to New York for three years where she taught in a professional studio. 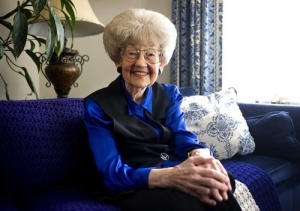 She returned to BYU in 1959. After her return, she was invited by the Department of Defense to organize a performance for servicemen in the Pacific in 1960. She went on to organize several international tours through both the U.S. Department of Defense and the Department of State. She created Young Ambassadors in 1969 in response to an invitation to send a group of performers to represent the United States at the 1970 World Expo in Osaka, Japan. From then on, Young Ambassadors received invitations to perform internationally. She incorporated service into the itinerary of her traveling groups. While they performed in grand venues and large crowds at night, during the day they performed in hospitals and orphanages. In 1971, she formed Lamanite Generation, later renamed Living Legends, which featured Native American youth, and later, Latin American and Polynesian cultures. She formed a total of six touring groups while at BYU. To her students, she was also a mother. She had the ability to bring out talent, remove barriers, and connect deeply. She was known to bring food to students who were struggling financially. She was also a bit of a matchmaker. Thompson created a scholarship fund from the sales of her own recordings. She also donated her time to Provo’s America’s Freedom Festival. She worked on shows up until her death on June 1, 2013. In 2009 the film Janie Thompson: Performance of Faith premiered at the LDS Film Festival in Orem, Utah, which honored Thompson for all of her contributions to BYU. She has received many awards for her service. She was a member of The Church of Jesus Christ of Latter-day Saints and served a full-time mission to Wales. This page was last edited on 19 December 2015, at 00:39.